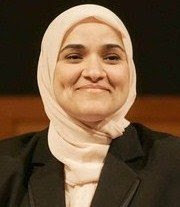 Dalia Mogahed, a veiled Egyptian American, will advise President Obama on prejudices and problems faced by Muslims. Many Arabs hope it's a step toward reversing stereotyping. Reporting from Cairo — Egyptians are cautiously rejoicing over the recent appointment of a veiled Egyptian American Muslim woman as an advisor to President Obama. El-Hennawy is in The Times' Cairo Bureau.